In brief: A new-ish restaurant from the former chef/owner of a nyc legend Chantrelle. The food is modern, not too fussy and everything has an interesting twist to it. It's that time of year already, whereby we indulge in a fancy lunch with our favorite lunchmates Liz and Peter. This restaurant opened under my radar, I didn't even know that Veritas was no longer, but I was excited to try it once I took a look at the menu and found out its pedigree. We were not disappointed, many of the dishes had an asian twist to it without being obnoxious and still interesting. My seafood sausage sandwich was quite lovely, though I thought the bun was a bit much. 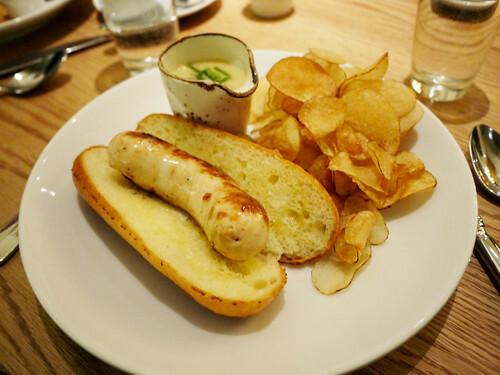 It tasted like eating a lobster roll in a sausage format.